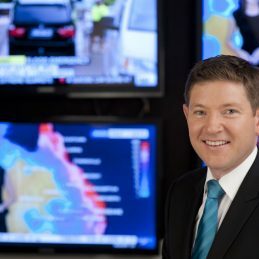 With more than 20 years professional experience, Jim is best known as an award winning sports journalist and senior presenter on Fox Sport News and Sky News. As a sports anchor on both channels, Jim gets to ‘chew the fat’ with a range of sporting luminaries on the topics of the day. A sought after event host, Jim Callinan has fronted a wide range of sporting and charity events. Most recently, Jim hosted functions at the Rugby League World Cup finals series, along with NRL grand final day. A regular MC at Sydney’s The Star Casino, Rugby is a also strong suit – with event work at Bledisloe Cup matches in both Sydney and Auckland, along with past British and Irish Lions contests. Away from rugby, Jim has worked at ICC World Cup ODI matches, SCG tests, AFC Football games & Socceroo World Cup qualifiers. For the last five seasons, Jim has been the corporate MC and on-field match day host for Bash League side, the Sydney Thunder. Jim’s experience, professionalism and personality make him an ideal host for any corporate gathering.